DAAR Members Give Back: Build Day with Loudoun Habitat a Success! REALTORS® and Affiliates give their time, talents and resources to the causes that matter most to them. From raising scholarship funds to assisting with home repairs and handing out needed supplies at the holidays, REALTORS® and Affiliates devote themselves to improving the lives of those in the community. Members of the Dulles Area Association of REALTORS® are no exception. In 2016, DAAR sponsored an annual golf tournament benefiting Loudoun Habitat for Humanity which provides adequate housing for all Loudoun citizens in need. To date, Loudoun Habitat has provided 38 homes to partner families – 16 new homes and 22 rehab homes – reaching 140 individuals. Proceeds raised during last year’s charity golf event, helped to fund participation in DAAR’s Member Build Day for Loudoun Habitat this year on Tuesday, May 2nd. 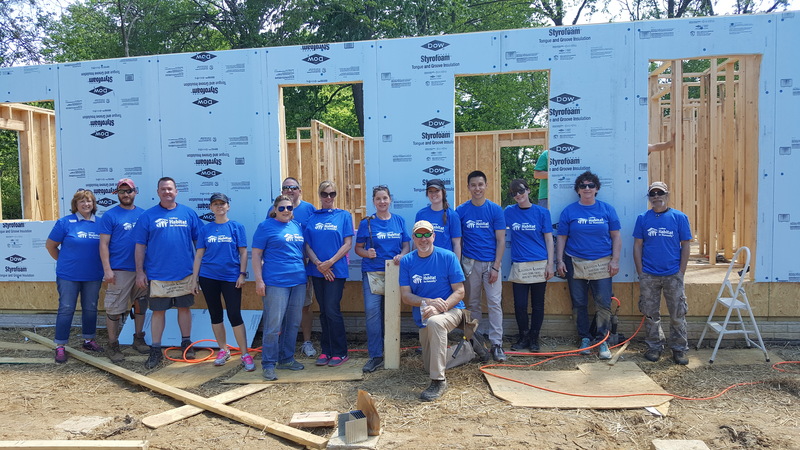 REALTORS® and Affiliates worked side-by-side during the day to build and erect interior walls, put up blue insulation board and tape all seams on the exterior of the house and began working on installing the bathtub shower combination for a home in Hamilton, Virginia. Barbara Duggar, Century 21 Redwood. Thank you to our DAAR Habitat Build Day sponsors Vesta Settlements, Apex Home Loans, New World Title and Toll Brothers!